Clinical onboarding is site specific, which means all sites have their own paper work requirements. It is extremely important to your success in the nursing program to pay attention to detail and supply accurate information. It is imperative that you meet every deadline given and are able to obtain information quickly when requested. 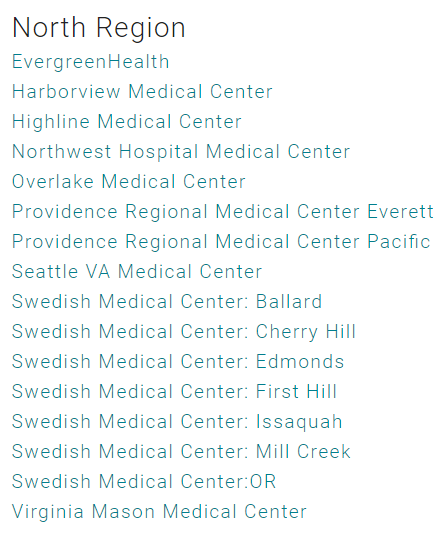 Bellevue College is fortunate to have many healthcare partners that would like to give you a wonderful experience in patient care. With our healthcare partners, we have created a set of standard processes all Bellevue College Nursing students need to follow. Once admitted to a nursing program, you will be informed which specific processes you need to complete to move forward with your clinical assignments. For the onboarding requirements for the healthcare partners listed on the left, please go to Clinical Placements Northwest (CPNW) and follow the link provided for the healthcare facility where you have been assigned. Students pay for CPNW services through Bellevue College via a fee that is charged with tuition. CastleBranch is a FERPA-compliant organization that Bellevue College uses for background check screening, immunization tracking, and medical document management. This organization verifies compliance of student-uploaded documents, and enables us to provide information to healthcare partners to ensure a safe environment for students and patients. Once you are admitted to a Bellevue College nursing program, you will receive CastleBranch package codes for ordering a nationwide or Washington background checks, and immunization tracker. Students are directly responsible for all associated fees. Some healthcare partners require additional background checks through the Department of Social and Health Services. Once you complete the background check, you’ll be given a code from the website. Email this code, along with your date of birth, to the Nursing Clinical Coordinator at nursingclinicalinfo@bellevuecollege.edu. This process can take a couple weeks, so please complete as soon as instructed to do so. Students are directly responsible for all associated fees. Some heatlhcare partners require individual drug screening. You will be informed by the nursing program if you are assigned to one of these partners. Students are directly responsible for all associated fees. Forms should be typed and saved in a PDF format. Be sure to obtain a hard copy for yourself. Documents should not be double sided or stapled, and should include ALL pages (unless otherwise specified). Step 3: Submit completed forms to Clinical Coordinator. Do not submit to clinical site. Note: A reminder that parking continues to be an issue. Please do everything possible to carpool. Are you new or returning to Harborview MC? Maiden name (if you have one)? Please provide UWnetID if you have or had one. Step 3: Submit all completed forms and copy of ID to Clinical Coordinator. Step 4: Provide all completed forms plus a copy of your recent TB, Flu and CPR card to NursingClinical Coordinator. Step 1: Follow instructions for Online Background Check Authorization Form Completion. If Yes, please provide Melissa with your Employee ID #. Seattle Children’s Hospital (Seattle Children’s Human Resources) will be emailing you shortly with directions for their RedCarpet onboarding. TIPS: Google Chrome seems to work the best. If you need assistance, please call the Seattle Children’s IS department at (206) 987-1111. Please allow extra time in completing these trainings. It is important they are completed properly. The process typically takes students around 8-10 hours. This time (8hours) is accounted for in your orientation hours. Seattle Medical is a new site for our program and only requires a completed, up-to-date passport. At this time, no paperwork is required. Step 1: Complete and return the following forms to Nursing Clinical Coordinator. STEP 2: Bring your Epic Self-Learning Completion Record to the orientation. Notes: If you will not be working with IVs or central lines, you do not need to go to these sites. The InfoPort Completion Record, once printed off, can serve as a checklist of all orientation content that you need to complete. STEP 1: Review and Complete the following documents. STEP 2: Complete VA TMS Instruction Guide for Nursing students (July 2016) training. 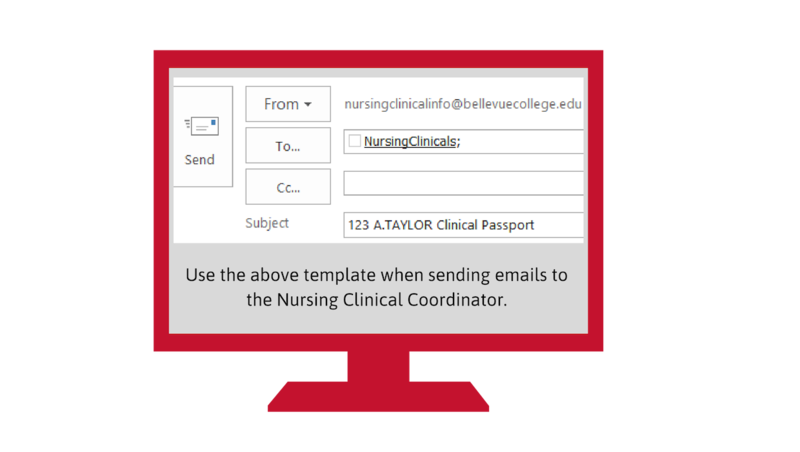 STEP 3: Submit all forms in a sealed envelope addressed to the Nursing Clinical Coordinator’s inbox in T208. STEP 4: MAKE YOUR Fingerprinting Appointment. Please notify the Nursing Clinical Coordinator after you have scheduled your fingerprinting and badging appointments. We need to track this information. o Verify that you have completed the mandatory training course titled: VHA Mandatory Training for Trainees by looking in your “completed work folder” in your TMS account.  If the certificate is still valid (good for one year), all you need is to print out the Certificate of Completion, and submit it to Melissa Meinhofer.  If the certificate had already expired, please complete the training module titled VHA Mandatory Training for Trainees-Refresher, print out that Certificate of Completion, and give it to the Nursing Clinical Coordinator. Returning students are not required to have a computer class unless it has been over one year since their last class. It is very important that students DO NOT use their cell phones to take pictures on any unit. Under no circumstances are students allowed to sign-in for, or have someone else sign into the computer for them. This could lead to the student, and possibly the school, being removed from VA clinical rotations. If you forget your password, please contact the VA Helpdesk from any internal hospital phone at 64357. If you have been to the VA before, please send the your badge expiration date to the Nursing Clinical Coordinator. If your badge is expired you will need to follow the processes for fingerprinting and badging again. Keep a copy of all your certificates. STEP 2: Bring HealthStream transcript to orientation. NOTE: Students who have not been in the facility for a year must repeat the orientation. STEP 1: Email the following to the Nursing Clinical Coordinator. STEP 2: Review and complete the Virginia Mason Code of 2018-2019 Onboarding Packet. STEP 3: Return forms to the Nursing Clinical Coordinator. STEP 4: Register and complete online learning modules on www.cpnw.org. See attachment for directions. STEP 5: Evidence of some diploma/degree completion.